People have loved beads for centuries because of their charm and appeal. They come in many shades, colors and shapes and are truly enchanting little wonders. 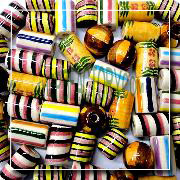 Stylish and colorful hand painted beads offer fashion with class and elegance. These beads exquisitely provide a refined personal touch that you will love and admire. You can make different types of fashion jewelry through hand painted beads- whether it is earrings, necklaces, bracelets or anything else. 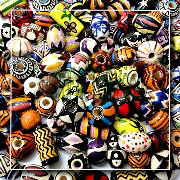 Peruvian traditional hand painted beads are also known as “Geometric Motifs” can be used for making various types of handmade jewelry for unique and beautiful pieces. Jewelry beads can make your beaded accessory a one of a kind sensation that will make a fashion statement on its own. Our traditional Peruvian hand painted beads is the right bead for making fashion jewelry. We have five sizes to choose from- use the XSmall and Small for earrings, the XLarge for necklaces and medium and large for these mentioned as well as any other type of jewelry. 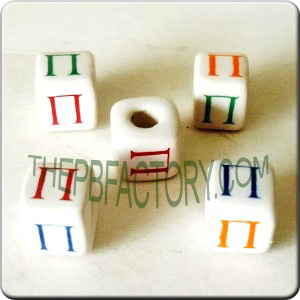 These beads are available in different shapes like oval, ball, cylinder and many more. 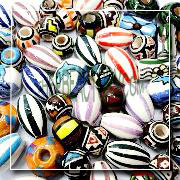 You can find Peruvian traditional hand painted beads of various designs at our store. 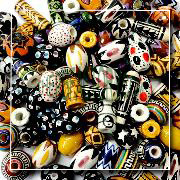 If we talk about jewelry designing, hand painted beads are the first option we think of. 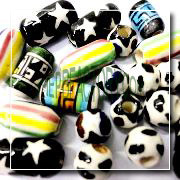 You will get a wide variety of hand painted beads at our online store. These little beauties are bright, bold and attractive. Hence, jewelry made with these beads is also very attractive and affordable.